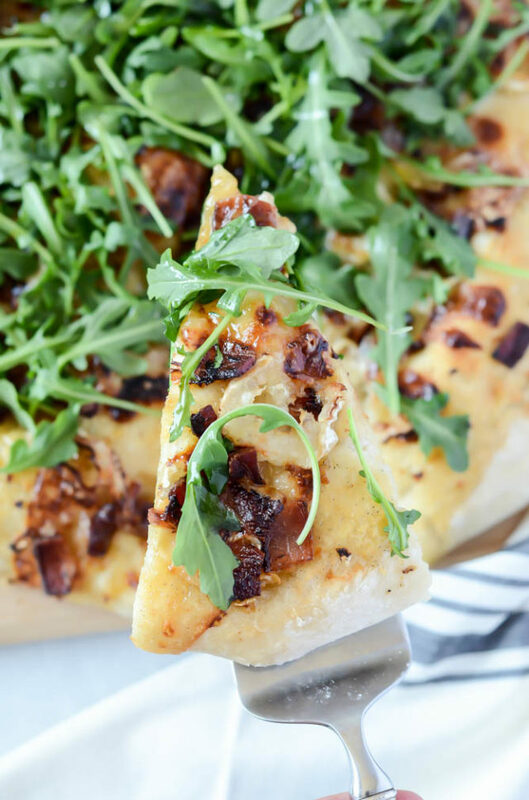 Are you ready for the pizza toppings to end all pizza toppings? 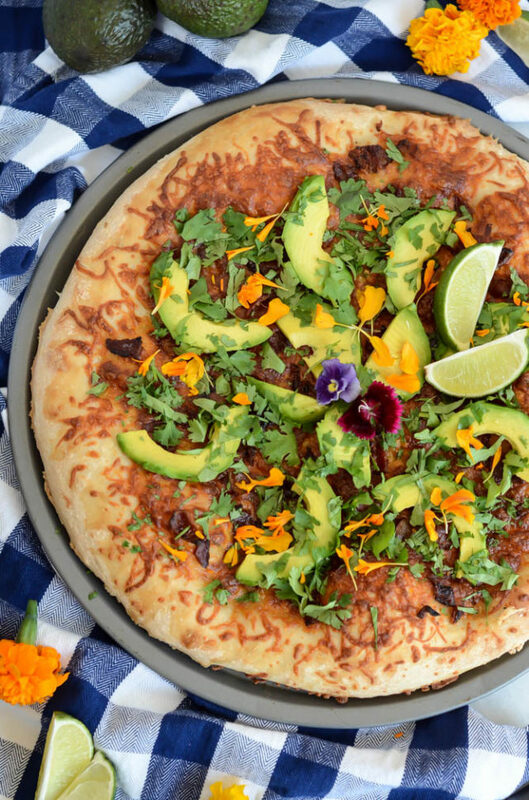 Because I’m pretty sure after eating this Avocado Pizza with Bacon, Cilantro and Lime you’re never going to want to go back to plain ol’ cheese or pepperoni again. 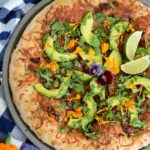 I mean, we all know what a bona fide hit avocado toast has become, so it would only make sense that avocado pizza follows suit. 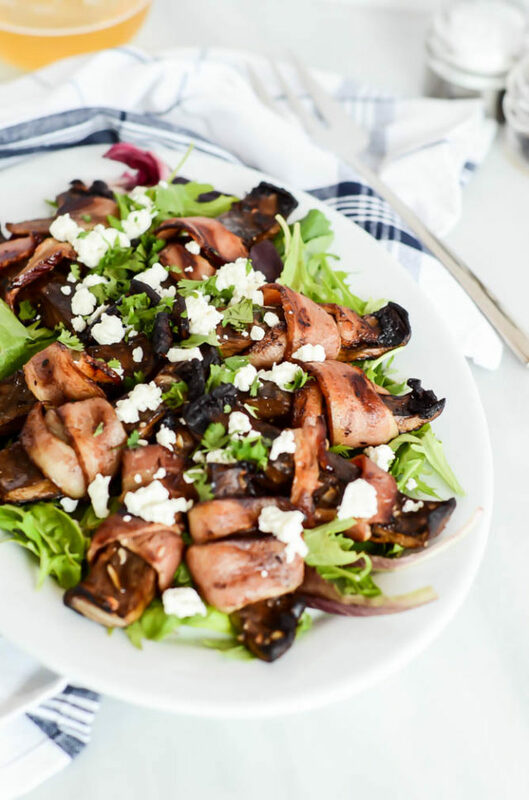 The mere fact that this recipe includes bacon means it’s perfectly acceptable for breakfast, and why not just call it a day by throwing a fried egg on top? You’re welcome for that little nugget of inspiration. In real world news, still no sign of baby. We “lived it up” this weekend as a family of two with a visit to the Harbor & Seafood Festival, a stop at the local pumpkin patch, a movie and some dinner out. We’re trying to enjoy as much time together as we can before our little girl gets here! On the NorCal wildfire front, I’m relieved to see that they’re getting things somewhat under control (comparatively speaking) and was uplifted to see some of my favorite local businesses reopening over the past few days. That’s not to say there’s still not a long way for Napa and Sonoma to go as far as recovery is concerned, but let’s hope the worst is behind us and things only go up from here. As I’ve been whipping through recipe development this past week, I’ve certainly not taken it for granted. 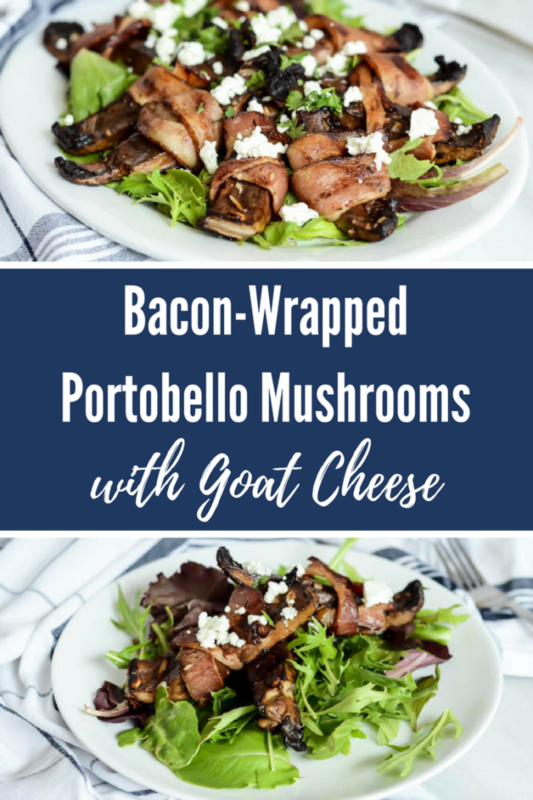 Often, when I’m pulling something out of the oven or stirring something on the stovetop, I find myself thinking about how, for my food-loving friends in Wine Country, whipping up a home-cooked meal is the last thing on their mind right now. I wish I could make a big feast and somehow get it up to them, but for now all I can do is continue to make delicious things and record them so that hopefully my friends can enjoy making some of my creations very soon. 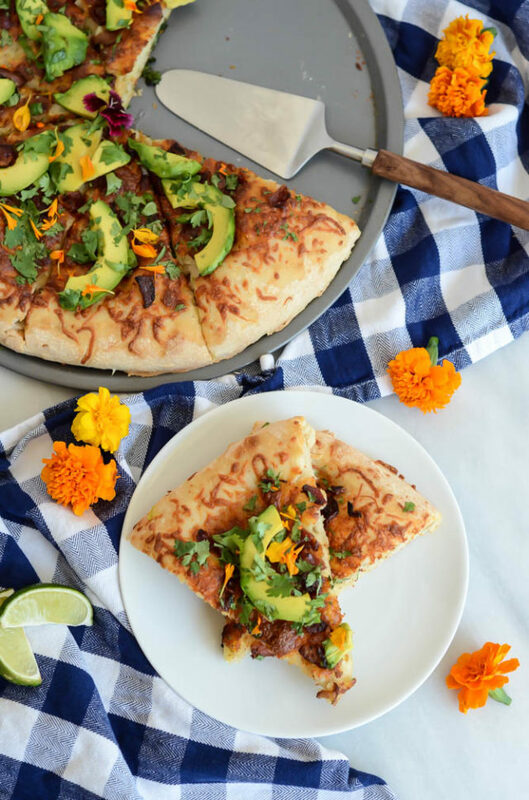 This Avocado Pizza with Bacon, Cilantro and Lime is one I know will be a huge hit with ANYONE who is blessed with the gene that makes you love cilantro (I hear that’s a thing? Sorry to all my cilantro-haters out there.) 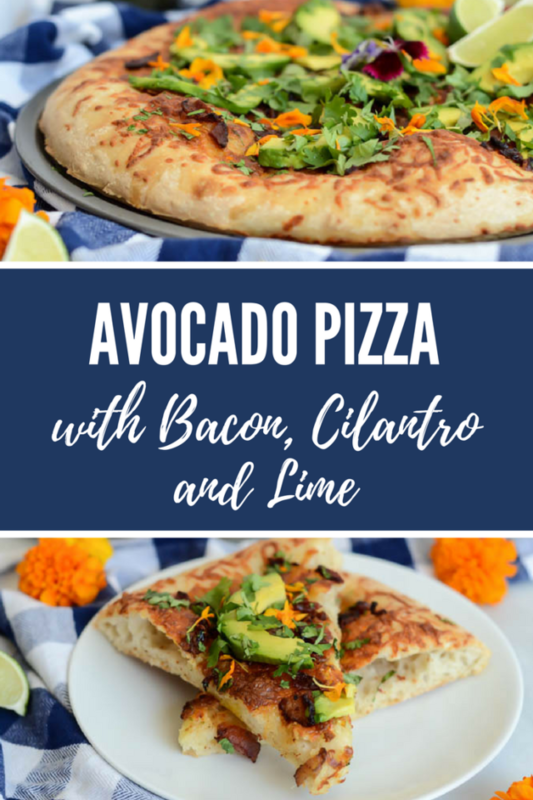 The combination of all four flavors – avocado, bacon, cilantro and lime – complimented by my go-to overnight pizza crust recipe and just a light dusting of cheese is seriously a party in your mouth. 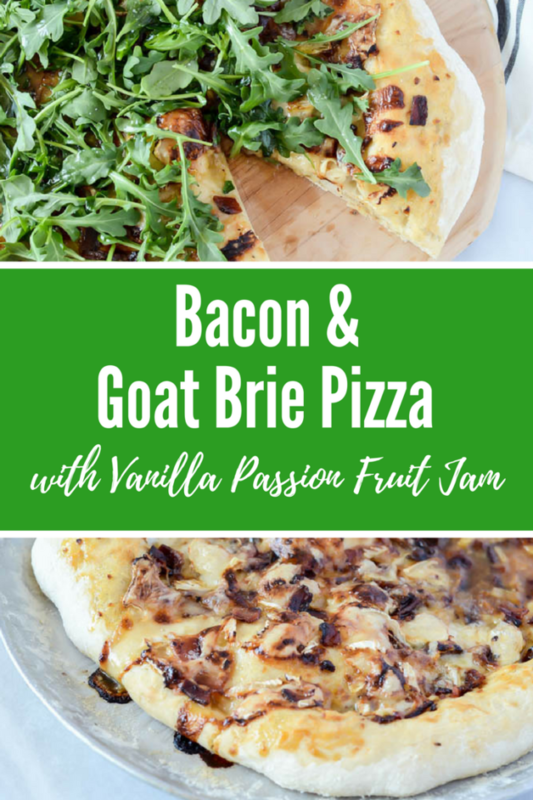 It seems like a bit of a cheater’s pizza, because really the only toppings you put on before baking are some olive oil, garlic and cheese, but the real flavor arrives as soon as you put on those finishing touches of creamy avocado, crispy cooked bacon, tart lime juice and fresh-chopped cilantro. 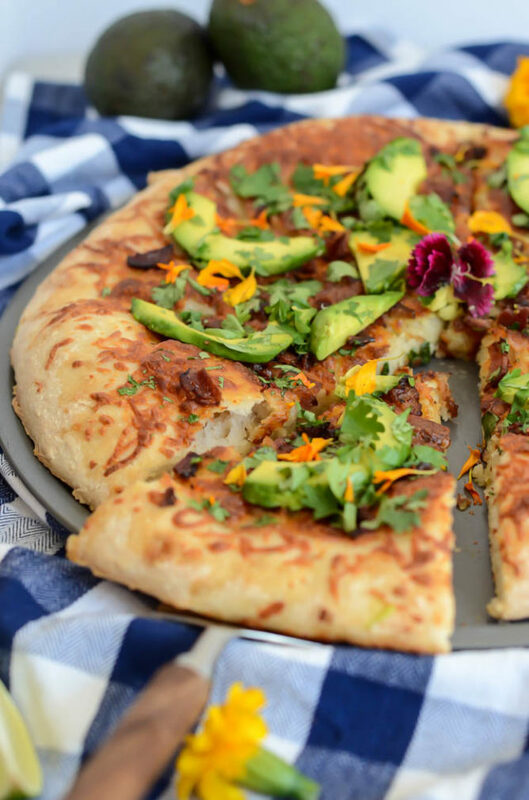 And if you’re like me and are usually too lazy to reheat anything when enjoying it for leftovers, Avocado Pizza with Bacon, Cilantro and Lime is going to be your new best friend. Promise. 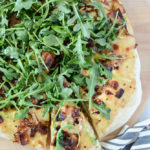 As I mentioned, I used my favorite from-scratch pizza dough recipe – Jim Lahey’s Overnight Pizza Dough – but you can easily use a premade dough or crust. I will say that, even though the words “overnight” and “from-scratch” may seem a bit intimidating, Jim Lahey’s recipe is SUPER easy and in my opinion well worth the little bit of extra planning it requires to mix up a batch of the dough the night before you plan on making the pizza. 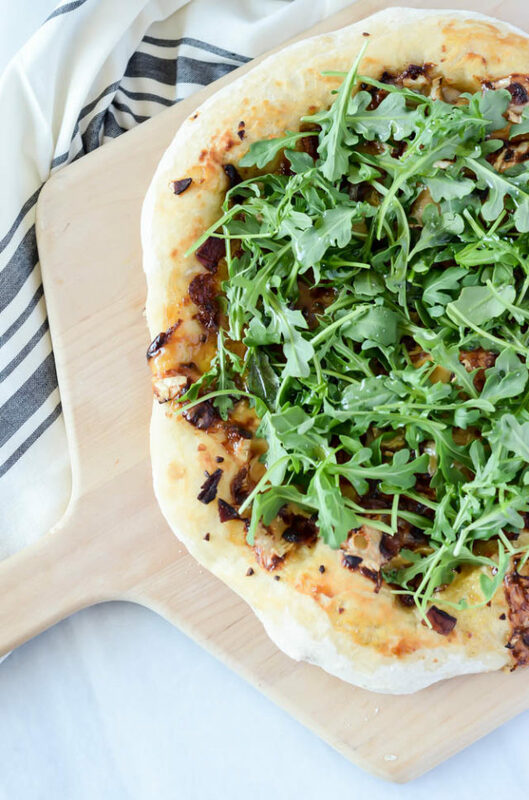 I don’t know about you, but pizza is a weekly go-to dinner in our household, and having a homemade version makes it infinitely better. 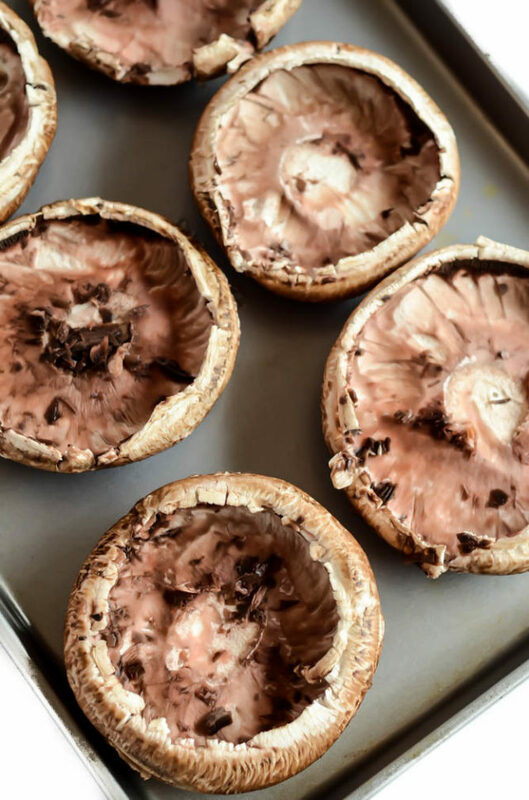 I love that you can add as much (or as little) of a topping as you want, and you can opt for healthier options like fresh vegetables, meats and herbs. Plus, it all comes together pretty quickly once you have your pie rolled out and ready to go in the oven! 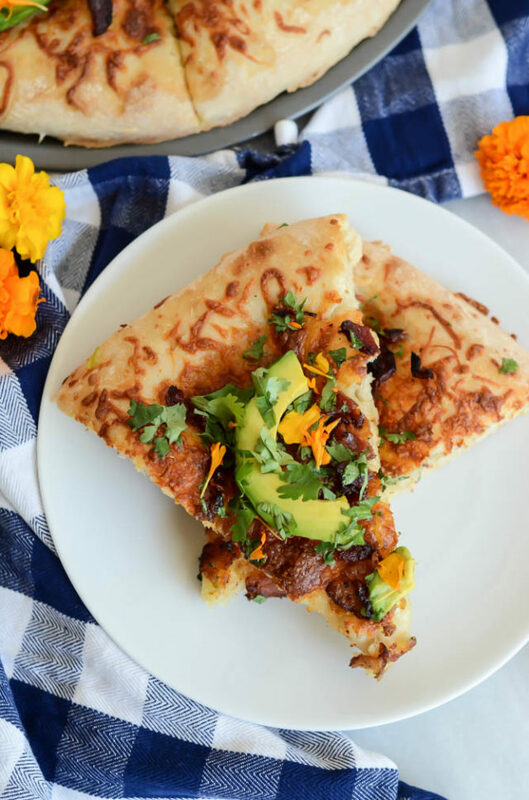 A traditional pizza dough is dressed up with fresh avocado, crispy bacon, a squeeze of lime juice and a sprinkle of fresh cilantro. The perfect flavor combo! 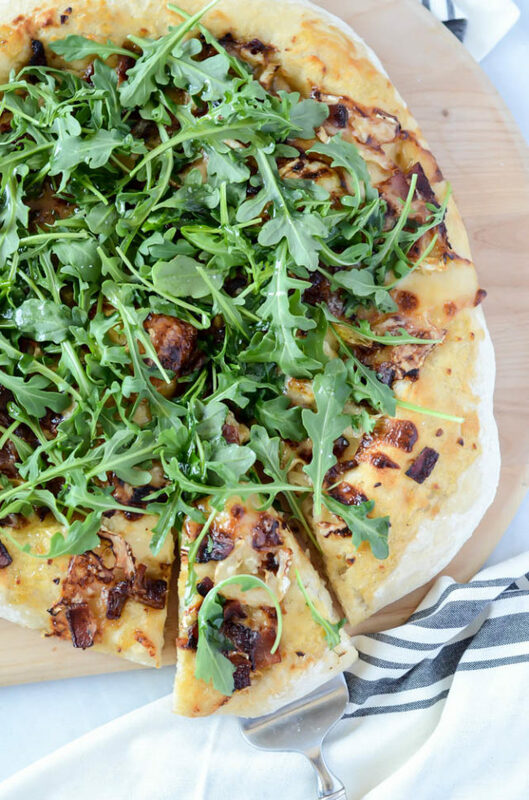 Brush olive oil evenly over pizza dough and sprinkle on minced garlic and cheese. 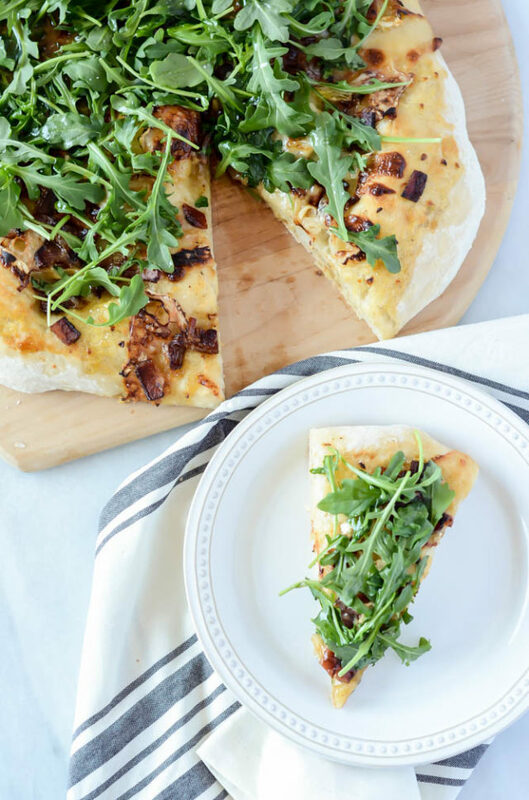 Bake in the preheated oven for 10-15 minutes, until the crust is lightly golden and the cheese has melted. Remove pizza from oven and let cool slightly (5 minutes or so) before adding the other toppings. Sprinkle the chopped bacon evenly over the pizza, followed by the avocado. Squeeze on the lime juice and finish with the chopped cilantro. Slice pizza into wedges and serve immediately. 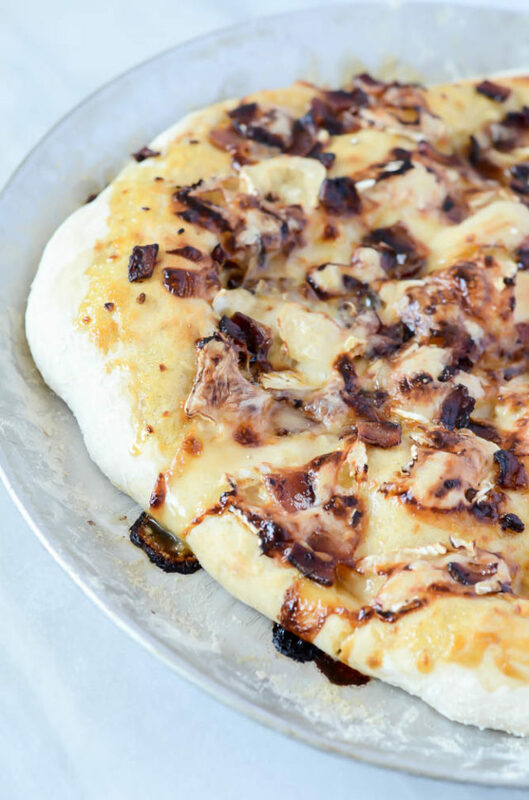 Find the recipe for Jim Lahey's pizza dough here. **Author’s Note: You may notice that this girl-powered post is coming to you a day later than my usual weekly posting schedule. We had originally planned to post our Spring Fling Brunch on Wednesday, March 8, but then discovered that many of the ladies in our lives (coworkers, friends, family, etc.) were participating in A Day Without a Woman. After some deliberation, we decided to postpone our posts until Thursday to show our support for all females and gender-oppressed individuals. As always, I so appreciate your support for me and so many of my fellow bloggers and lady entrepreneurs. 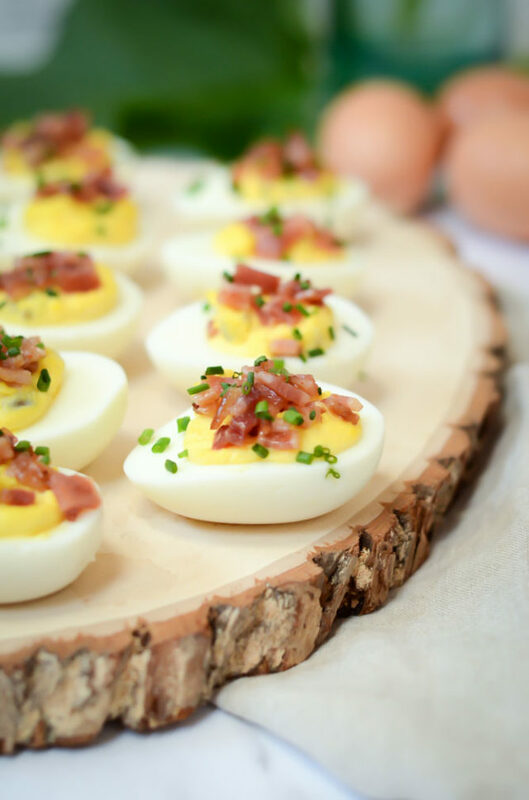 I hope you enjoy reading about our brunch just as much as we enjoyed throwing it! 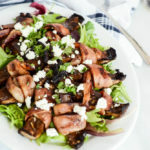 The classic Italian bread salad gets a morning makeover with the addition of bacon and eggs. 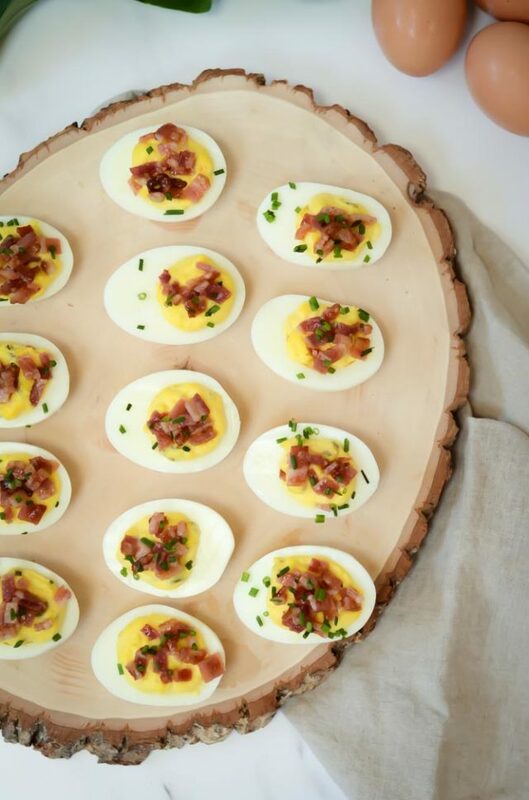 The perfect dish for a spring-themed brunch! I am so excited for today’s post because it has been a long time coming. I’ve mentioned it before, but I truly feel so fortunate to have met so many amazing lady entrepreneurs IRL in my small little community of Santa Barbara. I’ve met fellow bloggers, freelancers, small-business owners, you name it. I’ve enjoyed interacting with every single person I’ve had the pleasure of connecting with, and have learned so much by having this diverse sounding board to bounce ideas off of, ask for advice, etc. 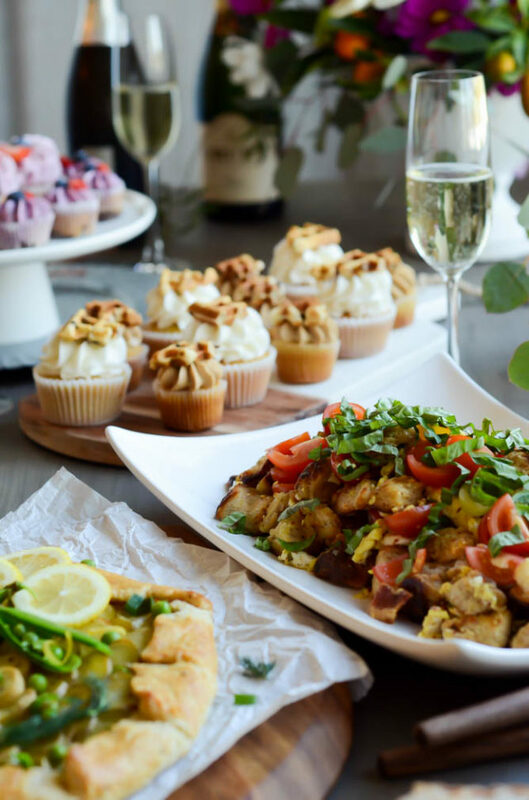 Way back in November, my fellow blogging babes, Hana-Lee from Wander and Wine and Becky from Baking the Goods, and I started throwing around the idea of a collaboration brunch. We all have such unique niches when it comes to our blogs (Hana-Lee focuses on wine and travel, while Becky’s the baker and I’m the cook with a side of mixology) that we thought it would be a great opportunity to play off of each other’s strengths and introduce our readers to all of the fantastic things everyone is doing in their own little corner of the Interwebs. Well, after much rescheduling and the craziness of the holidays, we were finally able to pull it off. 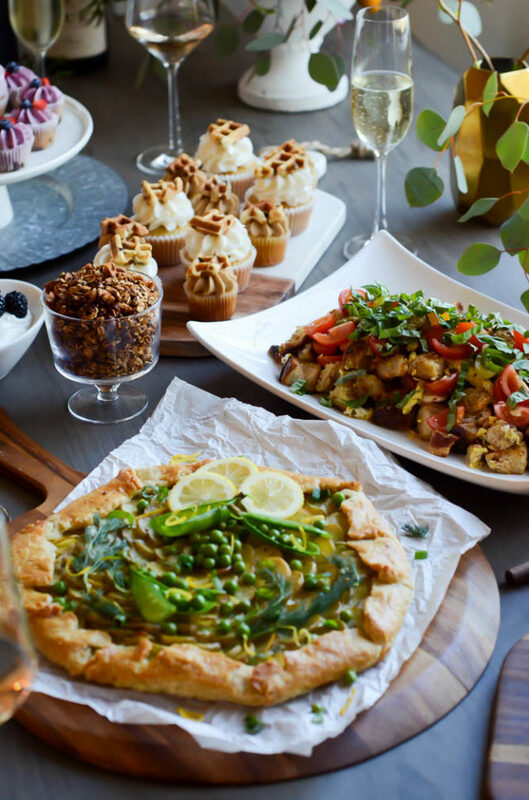 The result was a super fun and festive Spring Fling Brunch we held on a beautifully sunny day last week. 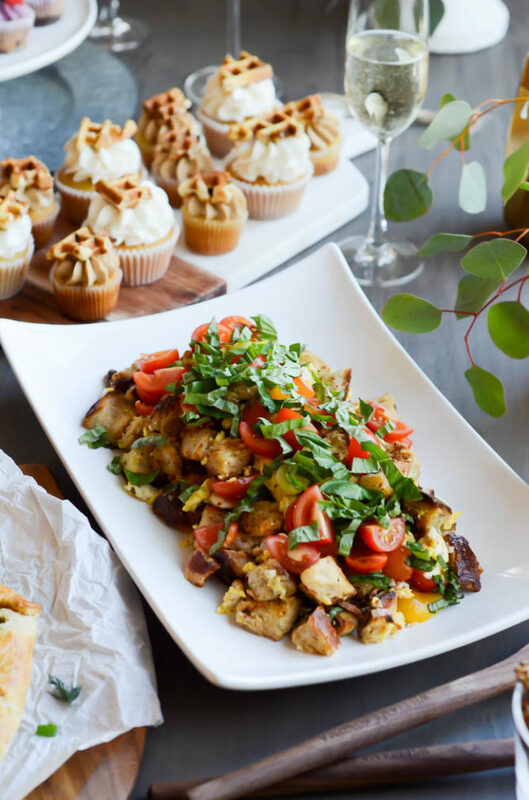 I whipped up this hearty Breakfast Panzanella, while Becky brought a stunning Ricotta, Potato & Spring Pea Galette and, of course, Hana-Lee brought the wine. We were also able to get some of our other local lady entrepreneurs involved – Vanessa from Garibaldi Goods provided her over-the-top delicious homemade bread (and some jam, of course! ), Amy from Bright Inc. provided the beautiful flower arrangements, and Alison from Sugar Cat Studio whipped up some brunch-themed cupcakes. Be sure to check out all of their blogs/websites/businesses because they are all amazing and work their little tushes off to turn out some amazing products. So fun! Let me just tell you, starting the photo shoot for this brunch at 12pm was pure torture. We did so in order to capture the best lighting, but by the end of our almost two-hour shoot, all of our stomachs were audibly growling because all of the food looked (and smelled) so good! Don’t worry, we were sure to taste everything afterwards because, you know, quality control. 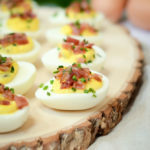 When we decided to give our brunch a spring theme, my mind immediately turned to creating a dish that was full of incredibly fresh ingredients (hello, warmer weather) yet hearty enough to not shock our systems too much after a season of all of those comforting winter foods. 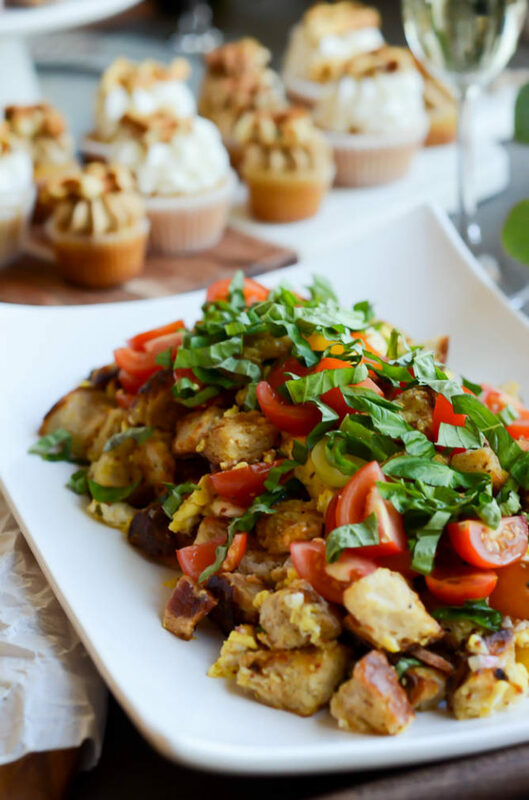 I knew a Breakfast Panzanella would go perfectly with the Spring Fling theme and set about making a version loaded with two of my favorite breakfast items – bacon and eggs, of course! I’m sure you’ve had (or at least heard of) the classic version of panzanella before, which generally consists of cubes of crusty bread, fresh basil and tomatoes, and some sort of dressing involving olive oil, vinegar, shallots and capers. For my Breakfast Panzanella, I omitted the capers in the dressing (I’m not the hugest fan) and of course added bacon and eggs, plus some fresh mozzarella, because CHEESE. What resulted was a perfectly balanced salad – the basil and tomatoes are a reminder that warmer weather is just around the corner, while the crusty bread gives the dish that hominess we still crave during this transition between the seasons. 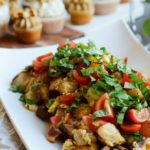 This Breakfast Panzanella is also loaded with protein from the eggs, bacon and mozzarella, so it will fill you up and give you a nice solid base for all of that wine you’ll be drinking. 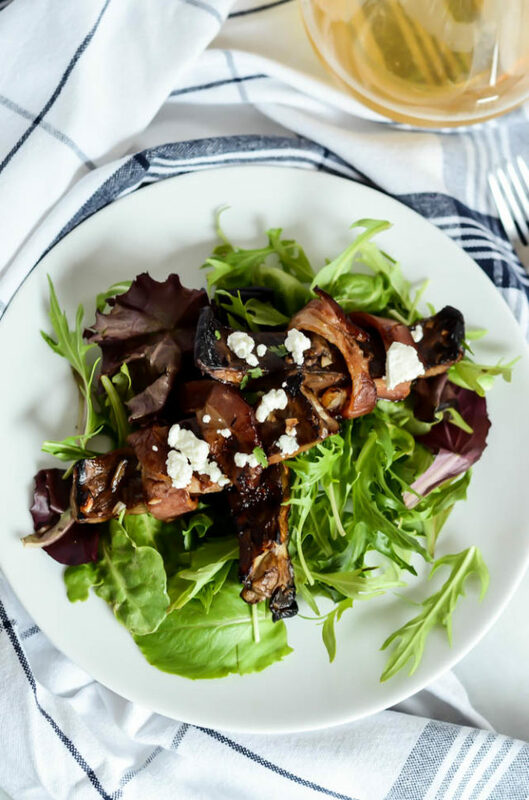 This salad also comes together in almost no time at all. 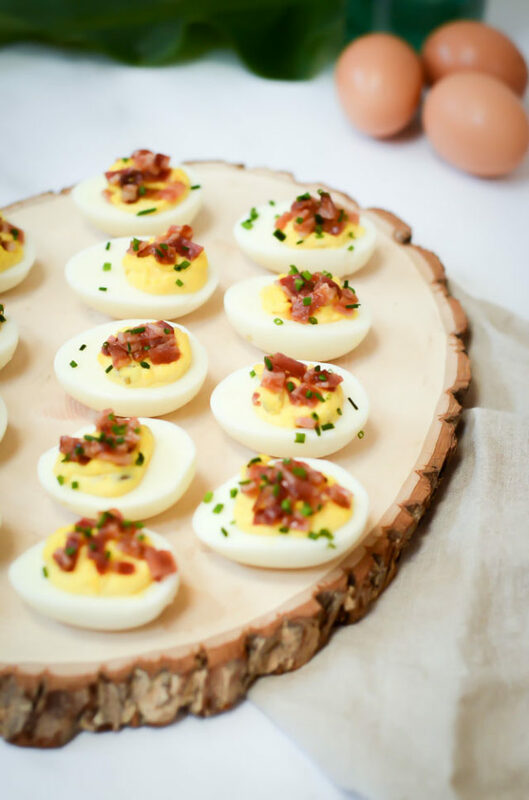 You can toast the bread cubes and cook the bacon the night before, which means you’ll be able to sleep in approximately 15 minutes more before you have to roll out of bed to scramble up some eggs and whisk together the dressing. What’s left after that is simply tossing everything together in one big bowl and garnishing with some fresh basil! 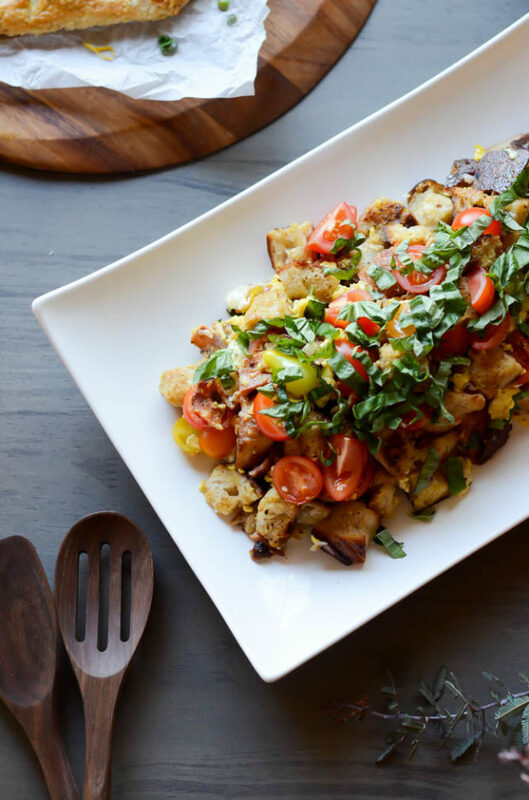 If this Breakfast Panzanella isn’t the perfect brunch dish, I don’t know what is. My recommendation to you? 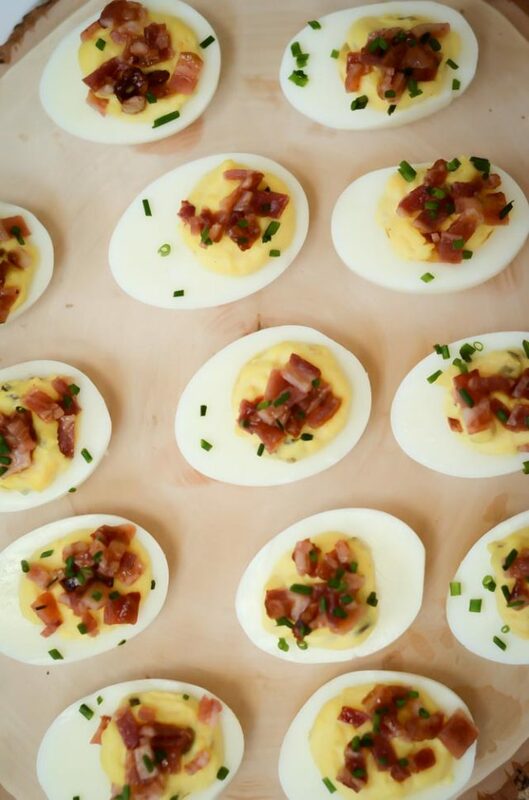 Call up some of your girlfriends STAT and set a date for a Spring Fling Brunch of your own. Then head on over to my gal pals’ blog posts for all of the other deets you’ll need to make it a smashing success. 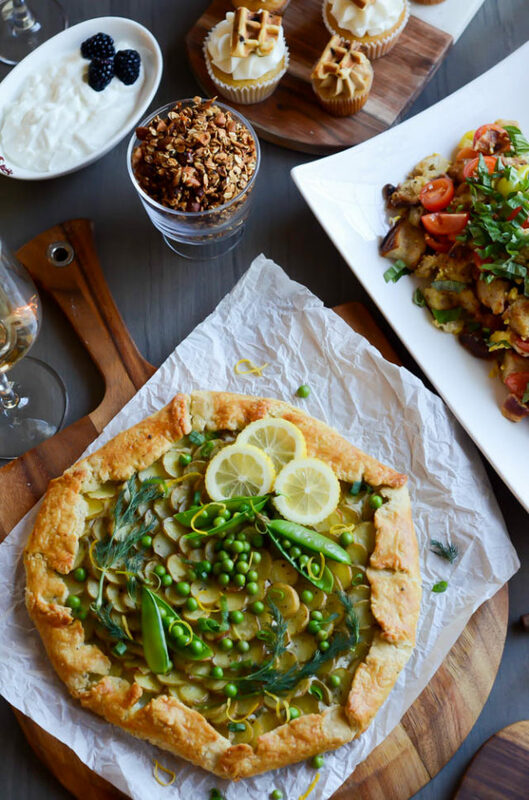 For the recipe for Becky’s Ricotta, Potato & Spring Pea Galette, head on over to Baking the Goods. For all of Hana-Lee’s wine recommendations and pairing notes, head on over to Wander and Wine. And be sure to check out all of the other ladies’ sites as well for further inspiration! and Garibaldi Goods for small-batch artisan foods from local California producers. Cook bacon in a large saute pan over medium heat. Once bacon is cooked, remove to a plate lined with a paper towel. Do not dispose of the bacon grease in the pan! Add 6-8 basil leaves to the saute pan with the bacon grease in it (still on medium heat) and then add the bread cubes. Toast, tossing to coat, until all of the cubes are golden brown. If the cubes seem dry, drizzle on a little olive oil as they continue to toast. You may notice that the basil gets crispy and crumbly as it cooks along with the bread, this is okay! The little bits of basil will add some additional flavor to the salad once it’s done. Once the bread cubes are nice and toasted, spread out on some parchment paper to dry out and cool completely. Next, mix up the vinaigrette. Combine all of the vinaigrette ingredients by shaking in a Mason jar or whisking vigorously in a small bowl. Set aside. Place the cooled bread cubes in a large bowl. 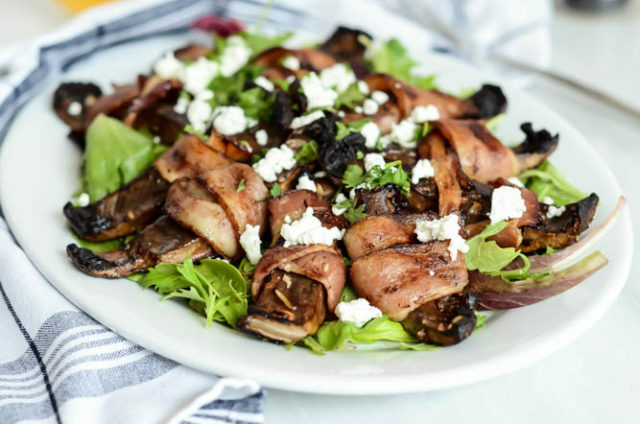 Chop up the now cooled bacon and add it to the bowl as well, along with the ½ cup of chopped fresh basil, cherry tomatoes, ciliegine and scrambled eggs. Pour the vinaigrette over the salad and toss to coat evenly. Garnish with additional chopped basil, if desired.